(CNN) -- Investigators have named Casey Anthony a suspect in the mid-June disappearance of her toddler daughter, Caylee, Florida authorities said Wednesday. Casey Anthony had been called a "person of interest" in her daughter's disappearance. Police had previously labeled Anthony -- who authorities said didn't report the 3-year-old child's disappearance until mid-July -- a "person of interest" in the case. "Casey is a suspect," said Orange County Sheriff's Department Capt. Angelo Nieves. "She has been uncooperative, leading investigators down the wrong path and lying to them. She has not provided any credible information about the last time she saw her or where she was left." 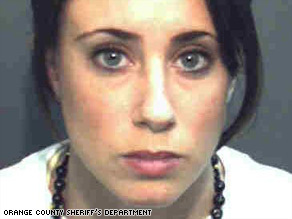 Casey Anthony of Orlando, Florida, was arrested July 16 on suspicion of telling detectives lies about Caylee's disappearance. She was released on bail after that arrest and subsequent arrests on unrelated theft charges. Authorities said weeks ago that evidence suggests Caylee is dead. Investigators found evidence of human decomposition in the trunk of Anthony's car, authorities have said. Authorities also have said they found traces of chloroform in the car Anthony drove and Internet searches of chloroform Web sites on her computer. Anthony and her daughter have garnered national headlines and served as fodder for nightly crime shows. Protesters have held vigils outside Anthony's home pleading with her to give police more information about Caylee's whereabouts. In connection with her July arrest, Anthony was charged with child neglect, making false official statements and obstructing a criminal investigation. CNN's Andrew Iden and Natisha Lance contributed to this report.